Glucose which is linked up with Beta Molecule is having single unit contains Monomer in Cellulose. Due to this cellulose having a structural bond of Liner chain. Most of the animal Gastro Intestinal tracts will not having the capacity to break down of cellulose in to particles. Effective Bacteria like Ruminococcus will only break down completely plant fibre to Monosaccharide Glucose Molecule. Later they will completely broke down and reformed in to Glycolysis. Interference, Combination of Genomes with Enzymes lead this break down activity in the most of Herbivorous animal Rumens. Most of the Organisms on the earth are not having ability, capacity to Digest the Cellulose, but some of the Herbivores animals and Termites are having capacity to digest the heavy amounts of Cellulose in them. Most of Vegetative animals (Horse, Cow, Buffalo, Sheep etc.) will digest cellulose simply in their digestive systems. But even these animals also can’t digest it on their own [1-3], because they don’t have enzymes that digest this material. So, for the digest of cellulose they defends on the different types of microbes, which are present in their stomach (rumen) . Nearly half of the living organism inside of the rumen are make up with bacteria. However, they play major role in the digestion of cellulose . Rumen is having the several group of life saving microbes in it, several Muscular Sacs are the main structure of Rumen, in the gaps between sacs the microbes will attack the cellulose and let it be digest in Intestinal Tract with Acid secretion combination. Papillae are the numerous minute finger like structure which acts as a wall of the Entire Rumen [6-10]. The ruminant stomach is composed of 4 separate compartments, named by Rumen, Reticulum, Omasum, and Abomasum [11-13]. Rumen is the largest compartment, where the billions of microbes living in a symbiotic manner. In the rumen herbivores different types of bacteria are present, which are active in digestion of the cellulose, hemicellulose, starch, lignin, protein and very small amount of oils [14-25]. 1. Most of the bacteria present in the rumen are Gram positive cocci and rods . 2. Anaerobic or Obligate anaerobic bacteria are present in the rumen because there is very little amount of oxygen present in the rumen [27-29]. 3. The optimum pH is lies between 6 – 6.9 . 4. For the growth of rumen bacteria suitable temperature is 39ºC. Ex: Fibrobacter succinogenes, Ruminococcus albus, Butyrivibrio fibrisolvens, Ruminobacter amylophilus and Treponema saccharophilum. The second highest majority of microbes living in the rumen are protozoa. Protozoa is a first discovered microbe in rumen. These single celled animals called protozoans and bacteria done most of the digestive work. Most of the protozoa found in the rumen are Ciliates [31-37]. Depending upon their morphology characteristics ciliate protozoans classified into two groups - Holotrichs and Spirotrichs. Ex: Isotricha prostoma, Dasytricha ruminantium, Diplodinium indicum and Metadinium medium. Fungi also present in the rumen, these was confirmed by the presence of chitin in its cell wall. These obligate anaerobic fungi have an active role in the fibre degradation [38-41]. Ex: Neocallimastix frontalis, Sphaeromonas communis, Piromyces communis and Caecomyces equi. These mircobes also help in the fibre degradation. Archaea is an ancient group, separated from other two domains of life, Bacteria and Eukaryotes [42-52]. These archaea in rumen use O2 and CO2 to produce methane. The methanogens play a vital role in the rumen fermentation. Yeast are stabilized the pH of rumen and enhance fibre degradation [53-61]. Reticular Rumen is having several types of Bacteria, Fungi, Archaea and viruses Combination of Protozoa with Bacteria is having a major assert up to 60% of the Microbial dominates in the Rumen Omasum is the big sac inside the stomach which is main site for Microbial processing of break down cellulose, there they will start their process with Fermentation inside the stomach [62-71] figure 1. Abomasum’s pH level is 4 due to this reason it is transformed as a big carrier to kill Fauna, Flora which are flowing in it . Figure 1: The role of rumen microorganisms. Digestion which takes place in the Rumen is very much Complexive process, Reticulo rumen is the only organ which is there to digest, engulf, break down the cellulose [73-75]. Carbohydrates which are having non-structural category will play a main role in cellulose digestion with the help of Microbial enzymes. Convrsation of Monosaccharaides in to transforming of Microbes will leads to digest Cellulose in reticulo Rumen [76-79]. For the degradation and break down of the cellulose in the Ruminants digestive cavity, Ruminococcus bacteria plays major head role. Whatever the feed type given to Ruminant Microbial population will only effect the process, More about, apart from these Microbials present in the 70% of the Ruminanats Gastro Intestinal Tract are has to be identified yet by Scientific Researchers. Central Statistical Agency. Federal Democratic Republic of Ethiopia Central Statistical Agency, Agricultural Sample Survey 2011/12. Report On Livestock and Livestock Characteristics.2012. Hansen J and Perry B. The epidemiology, diagnosis and control of helminth parasites of ruminants. ILRAD, Nairobi, Kenya.1994. Taylor MA, et al. Veterinary Parasitology (3rd edn. )Blackwell Publishing Ltd. 2007. Panayotova-Pencheva MS and Alexandrov MT. Some pathological features of lungs from domestic and wild ruminants with single and mixed protostrongylid infections. Vet Med Int. 2010:741062. Alemu S, et al. Study on small ruminant lungworms in northeastern Ethiopia. Vet Parasitol. 2006;142:330-335. Regassa A, et al.Lungworm infection in small ruminants: Prevalence and associated risk factors in Dessie and Kombolcha districts, Northeastern Ethiopia. Veterinary Parasitology. 2010;169:144-148. Ibrahim N and Godefa Y. Prevalence of ovine lungworm infection in Mekelle town, North Ethiopia. The Inter J Vet Med. 2012;9:1-7. Fentahun T, et al. Prevalence of lungworm infection in small ruminants in and around Jimma town, Southwest Ethiopia. Global Veterinaria. 2012;9:580-585. Eyob E and Matios L. The prevalence and risk factors associated with ovine lungworm infestation in the Asella province, Central Ethiopia. J Parasitol Vector Biol. 2013;5:116-121. Terefe Y, et al. Prevalence of lungworm infection in small ruminants in North Gondar zone, Amhara National Regional State, Ethiopia. J Parasitol Vector Biol. 2013;5:40-45. Kebede S, et al. On farm and abattoir study of lungworm infection of small ruminants in selected areas of Dale district, Southern Ethiopia. Int J CurrMicrobiol App Sci. 2014;3:1139-1152. Ethiopian Sheep and Goats Productivity Improvement Project (ESGPIP). Technical Bulletin No. 8: Body condition scoring of sheep and goats. 2008. Thrusfield M. Veterinary Epidemiology (3rd edn. )Blackwell Science, UK. 2005. Foreyt WJ. Veterinary Parasitology Reference Manual (5th edn) Owa State University Press, Blackwell Publishing, USA. 2001. Addis M, et al. Study on the prevalence of lungworm infection in small ruminants in Gondar town, Ethiopia. Veterinary Research. 2011;4:85-89. Moges N, et al. Dictyocaulusfilaria and Muelleriuscapillaris are important lungworm parasites of sheep in Wogera district, Northern Ethiopia. International Journal of Animal and Veterinary Advance. 2011;3:465-468. Weldesenebet D and Mohamed A.Prevalence of small ruminant lung worm infection in Jimma town. Global Veterinaria. 2012;8:153-159. Yildiz K. Prevalence of lungworm infection in sheep and cattle in the Kirikkale province. TurkiyeParazitolDerg. 2006;30:190-193. Girisgin O, et al. Studies on sheep lungworms in Bursa province of Turkey: Determination of prevalence and relationships between larval output and parasite burden in the lungs. Pakistan J Zool. 2008;40:365-369. Dar LM,et al.Prevalence and Pathology of Lung Worm Infection in Sheep in Kashmir Valley, India. AnimSciAdv. 2012;2:678-685. Borji H, et al. Study on small ruminant lungworms and associated risk factors in northeastern Iran. Asian Pac J Trop Med. 2012;5:853-856. Yagoob G, et al. Prevalence of small ruminant lung-worm infestation in Tabriz city, Iran. Indian Journal of Fundamental and Applied Life Sciences. 2014;4:320-323. Berrag B and Urquhart GM. Epidemiological aspects of lungworm infections of goats in Morocco. Vet Parasitol. 1996;61:81-85. Kudrnácová M, et al. A study on lungworms occurrence in farm-bred sheep from north Bohemia (Czech Republic). ScientiaAgriculturaeBohemica. 2013;44:6–9. Domke AV,et al.Prevalence of gastrointestinal helminths, lungworms and liver fluke in sheep and goats in Norway. Vet Parasitol. 2013;194:40-48. Panayotova-Pencheva MS. Species composition and morphology of protostrongylids (Nematoda: Protostrongylidae) in ruminants from Bulgaria. Parasitol Res. 2011;109:1015-1020. Walkden-Brown SW and Kahn LP. Nutritional Modulation of Resistance and Resilience to Gastrointestinal Nematode Infection: A Review. Asian-Aust J AnimSci. 2002;15:912-924. Radostits OM, et al. Veterinary Medicine: A textbook of the diseases of cattle, horses, sheep, pigs and goats (6thedn. )Saunders Ltd., Elsevier. 2007. Adugna T. Livestock Feed Supply Situation In Ethiopia: Commercialition of Livestock Agriculture in Ethiopia. Addis Ababa, Ethiopia. 2008. Orwa C,et al.Agroforestry database: a tree reference and selection guide version 4.0. 2009. Teferi A, et al. Management and utilization of browse species as livestock feed in semi-arid Woreda of North Ethiopia. 2008. Devendra C. The use of shrubs and tree fodders by ruminants. In: Devendra C (ed.) Shrubs and Tree Fodders for Farm Animals. International Development Research CentreOttawa, Canada. 1990. Anugwa, FOI and Okori AU. The nutritive value of three Nigerian browse plants eaten by sheep. Bulletin of Animal Health and Production in Africa. 1987;35:23-228. SibandaS. Cattle food resources and their use in communal lands. Journal of Zimbabwe Society Animal Production. 1993;5:37-42. Topps JH. Potential,composition and use of legume shrubs and trees as fodder for livestock in the tropics (a review). Journal of Agricultural Science in Cambridge. 1992;118:1-8. Russel JB and Baldwin RL. Substrate preference in rumen bacteria: evidence of cataboliet regularity mechanisms. Appl Environ Microbiol. 1978;36:319-329. Egan AR. Principles of supplementation of poor quality roughages with nitrogen. In: Dixon R M (Edn), Ruminant feeding systems utilizing fibrous agricultural residues 1985.IDP (International Development Programme of Australian Universities and Cilleges Ltd.), Canberra, Australia. 1985;49-58. Van Soest PJ. Nutritional ecology of the ruminant: O and B books, Corvallis, Oregon, USA. 1982. Ndlovu LR. Complementarily of forages in ruminant digestion: Theoretical consideration. In: Stares JES, Said AN, Kategile JA (eds. )The complementarities of White feed resources for animal production. 1992;18-21. Pamo TE, et al. Effects of Calliandracalothyrsusand Leucaenaleucocephalasupplementary feeding on goat production in Cameroon. Journal of Small Ruminant Research. 2006;65:31-37. Pamo TE,et al.Nutritive values of some basic grasses and leguminous tree foliage of the Central region of Africa. J Anim Feed Sci Technol. 2007;135:273-282. Gatenby RM, et al. Animal Production in the Hills of Nepal. PAC Technical Paper 112.Dhankuta, Nepal. 1989. Larbi A, et al. Forage potential of Erythrinaabyssinica: Intake, digestibility and growth rates for stall-fed sheep and goats in southern Ethiopia. Journal of Agro ForestrySystems. 1993;21:263-270. Gatenby RM. Sheep. The tropical Agriculturalist Series. MacMillan publishers. 2002;178. Devendra C. Forage supplements: nutritional significance and utilization for draught, meat and milk production in buffaloes. Proceedings II World Buffalo Congress, New Delhi, India. 1988. Fowler ME. "Medicine and Surgery of Camelids", Ames, Iowa: Wiley-Blackwell. Chapter 1 General Biology and Evolution addresses the fact that camelids (including camels and llamas) are not ruminants, pseudo-ruminants, or modified ruminants. 2010. Richard FK and Bargo MS. Early Miocene Paleobiology in Patagonia: High-Latitude Paleocommunities of the Santa Cruz Formation, Cambridge University Press. 2012. "Suborder Ruminatia, the Ultimate Ungulate". Russell JB. 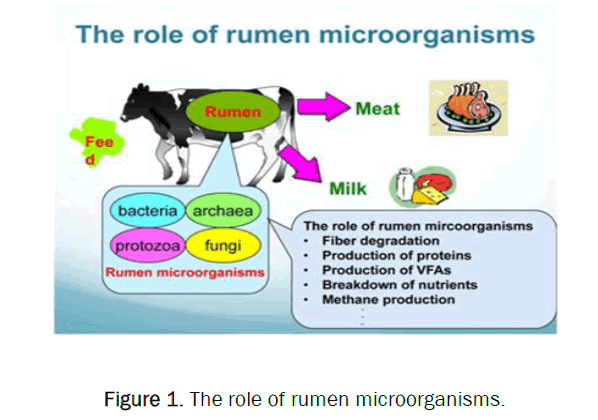 Rumen Microbiology and its role In Ruminant Nutrition. 2002. Reece WO. Functional Anatomy and Physiology of Domestic Animals. 2005;357-358. Colorado State University, Hypertexts for Biomedical Science: Nutrient Absorption and Utilization in Ruminants. Ditchkoff SS. "A decade since "diversification of ruminants": has our knowledge improved?" Oecologia. 2000;125:82-84. Hofmann RR. "Evolutionary steps of ecophysiological and diversification of ruminants: a comparative view of their digestive system". Oecologia. 1989;78:443-457. Hackmann TJ and Spain JN. "Ruminant ecology and evolution: Perspectives useful to livestock research and production". J Dairy Sci. 2010;93:1320-1334. Hungate RE. The rumen and its microbes. Academic Press, NY. 1966. Russell JB. Microbiology of the Rumen. Animal Science 607 Class Notes, Cornell University. 1988. Van Soest PJ. Nutritional ecology of the ruminant. O&B Books, Inc., Corvallis. 1982. Adams SL and Hungate RE. Continuous fermentation cycle times-prediction from growth analysis. Industrial Engineering and Chemistry. 1950;42:1815-1818. Allison MJ, et al. Studies on the metabolic function of branched-chain volatile fatty acids, growth factors for Ruminocci. J Gen Microbiol. 1961;5:869-879. Allison MJ, et al. Detection of ruminal bacteria that degrade toxic dihydroxypyridine compounds produced from mimosine. Applied and Environmental Microbiology. 1990;56:590-594. Allison MJ, et al. Synergistes jonesii, gen. nov., sp.nov. : A rumen bacterium that degrades toxic pyridinediols. Systematic and Applied Microbiology. 1992;15:522-529. Amann R and Ludwig W. Ribosomal RNA-targeted nucleic acid probes for studies in microbial ecology. 2000;24:555-565. Anaerobe Laboratory. Anaerobe Laboratory ManualVirginia Polytechnic Institute and State University, Blacksburg, Virginia. 1975. Andrew WM, et al.Detection of Synergistes jonesii in cattle and sheep feces. 2000;9:165-168. Attwood GT, et al. Exploring rumen methanogen genomes to identify targets for methane mitigation strategies. 2011;166-167:65-75. Attwood GT, et al. Ammonia-hyperproducing bacteria from New Zealand ruminants. Appl. Environ. Microbiol.1998;64:1796-1804. Bailey MT, et al. Exposure to a social stressor alters the structure of the intestinal microbiota: Implications for stressor-induced immunomodulation. Brain Behav Immun. 2011;25:397-407. Bauchop T. Rumen anaerobic fungi of cattle and sheep. Appl Environ Microbiol. 1979;38:148-158. Bauchop T. The rumen anaerobic fungi: Colonizers of plant fibre. Ann Res Vet. 1979;10:246-248. Bhandari SK, et al. Dietary protein level and probiotic supplementation effects on piglet response to Escherichia coli K88 challenge: Performance and gut microbial population. Livest Sci. 2010;133:185-188. Bladen HA, et al. A study of bacterial species from the rumen which produce ammonia from protein hydrolyzate. Appl Microbiol. 1961;9:175-180. Bond DR, et al. Electrode-reducing microorganisms that harvest energy from marine sediments. Science. 2002;295:483-485. Brock TD, et al. Biology of Microorganisms. Prentice Hall, Englewood Cliffs, NJ. 1994. Brulc JM. Gene-centric metagenomics of the fiber-adherent bovine rumen microbiome reveals forage specific glycoside hydrolases. Proc Natl Acad Sci USA. 2009;106:1948-1953. Bryant MP. Bacterial species of the rumen. Bacterial Rev. 1959;23:125-153. Bryant MP. Commentary on the Hungate technique for culture of anaerobic bacteria. Am J Clin Nutr. 1972;25:1324-1328. Bryant MP. Nutritional requirements of the predominant rumen cellulolytic bacteria. Fed Proc. 1973;32:1809-1813. Bryant MP and Burkey LA. Cultural methods and some characteristics of some of the more numerous groups of bacteria in the bovine rumen. J Dairy Sci. 1953;36:205-217. Bryant MP, et al. Methanobacillus omelianskii, a symbiotic association of two species of bacteria. Arch Microbiol. 1967;59:20-31.